Bayer heroin bottle. 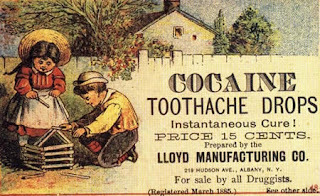 From 1898 to 1910 heroin was marketed as a non-addictive morphine substitute and cough medicine for children! 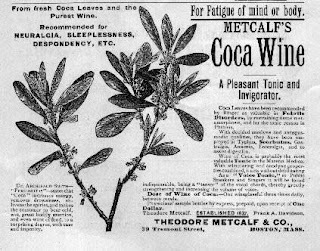 Metcalf's Coca Wine was one of a large number of cocaine-containing wines available on the market. All claimed medicinal effects, although they were undoubtedly consumed for their "recreational" value as well. Vin Mariani (c. 1865) was the leading Coca Wine of its time. 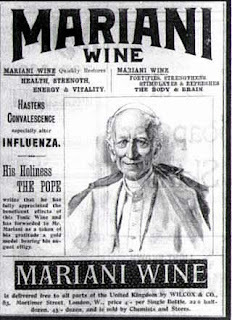 Pope Leo XIII purportedly carried a hipflask of Vin Mariani with him, and awarded a Vatican gold medal to its creator, Angelo Mariani. 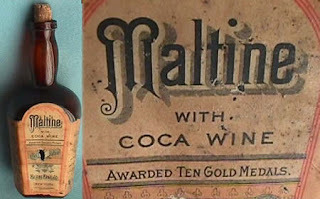 This coca wine was made by the Maltine Manufacturing Company (New York). The dosage indicated on the back of the bottle reads: "A wine glass full with, or immediately after, meals. Children in proportion." 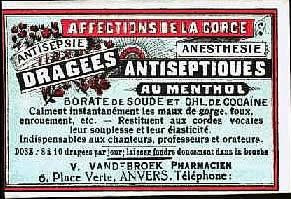 Cocaine-containing throat lozenges (c. 1900) were "indispensable for singers, teachers, and orators." In addition to quieting a sore throat, these lozenges undoubtedly provided the "pick-me-up" to keep these professionals performing at their peak. Paperweight advertisement for C.F. 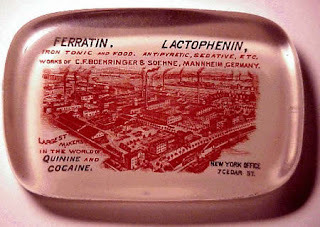 Boehringer & Soehne (Mannheim, Germany), "largest makers in the world of quinine and cocaine." This chemical manufacturer was proud of its leading position in the world's cocaine market. This bottle of Stickney and Poor's paregoric (mixture of opium and alcohol) was distributed much like the spices for which the company is better known. Doses for infants, children, and adults are given on the bottle. At 46% alcohol, this product is 92 proof which is pretty potent in itself. 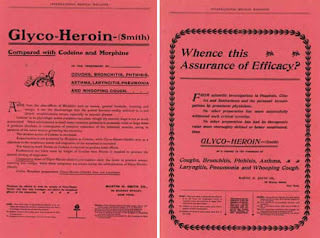 This ad is for Glyco-Heroin manufactured by Martin H. Smith Company (New York). 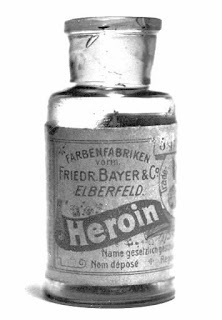 Heroin was widely used not only as an analgesic but also as a remedy for asthma, coughs, and pneumonia. Mixing heroin with glycerin (and often adding sugar or spices) made the bitter-tasting opiate more palatable for oral consumption. 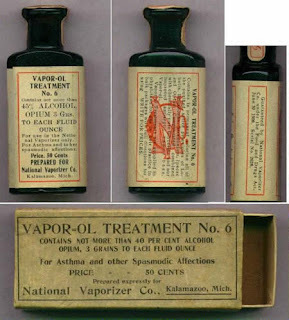 This National Vaporizer Vapor-OL (opium) Treatment no. 6 for asthma may have provided a unique method of essentially "smoking" opium. The volatile liquid was placed in a pan that was heated by a small kerosene lamp (see below). Other substances were also used in these early (c. 1890) vaporizers, but this mixture probably ensured plenty of visitors for the spasmodically affected.